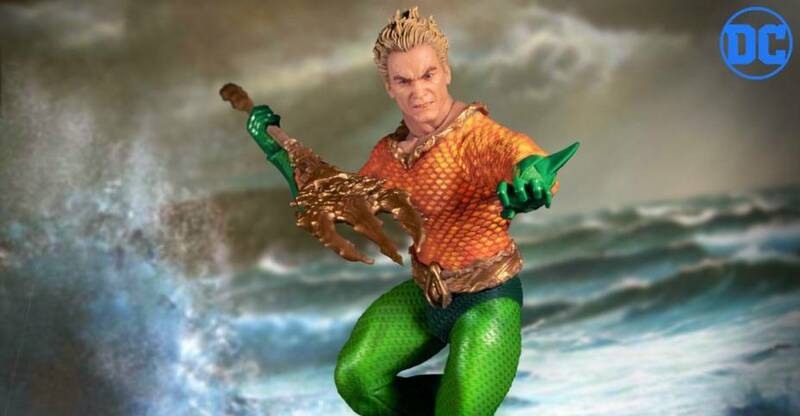 Mezco Toyz has opened up pre-orders for their DC Comics – Aquaman One:12 Collective Figure. The 1/12 scale figure includes three swap out portraits, multiple interchangeable hands, the Trident of Atlantis, a crown, and a display stand. It’s priced at $80 and is set for release between October and December. Pre-order at the link below, and see the new photos after the jump. Each One:12 Collective Aquaman figure is packaged in a collector friendly box, designed with collectors in mind. 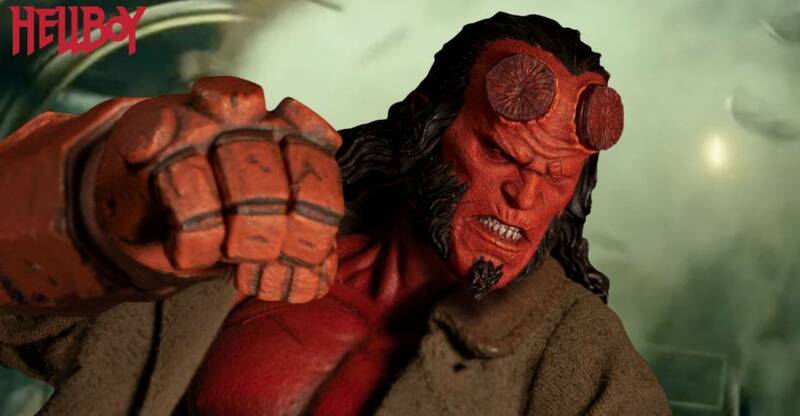 Mezco Toyz has opened up pre-orders for their new Hellboy One:12 Collective Figure. This release is based on the upcoming film, with David Harbour in the lead role. It’s priced at $80. The figure is due figure is due for release between March and May of 2020. Pre-order at the link below, and see the photos after the jump. Hellboy hits theaters on April 12th, 2019. You can watch the trailer here. Each One:12 Collective Hellboy figure is packaged in a collector friendly box, designed with collectors in mind. Pre-orders are live for the new IT (2017) – Pennywise One:12 Collective Figure coming from Mezco Toyz. The figure will stand about 6.7″ tall, with over 28 points of articulation. 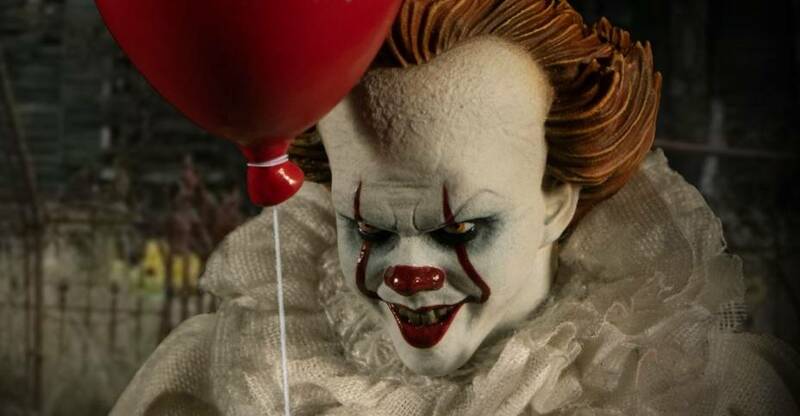 Pennywise includes four different interchangeable portraits, eight interchangeable hands, a paper boat, a red balloon, Georgie’s severed arm, a framed painting, and an articulated figure stand. The One:12 Collective Pennywise is priced at $100. The figure is scheduled for release some time between September and November. Pre-order Here. You can see photos and details after the jump. 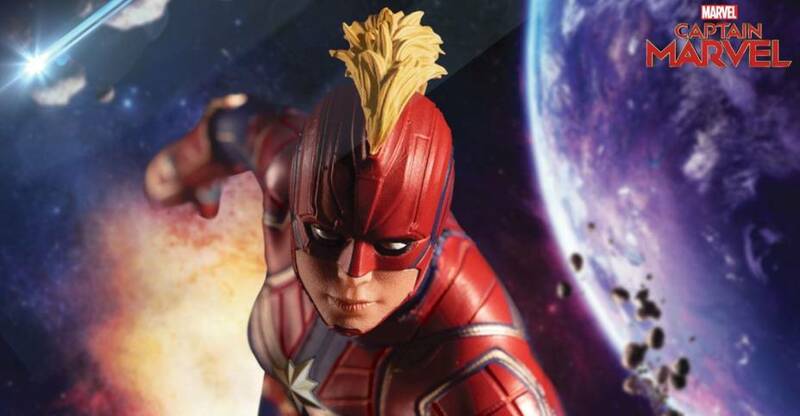 Mezco Toyz has opened up pre-orders for their new Marvel Studios Captain Marvel One:12 Collective Figure. The figure stands at 6.3″ tall, with over 30 points of articulation. 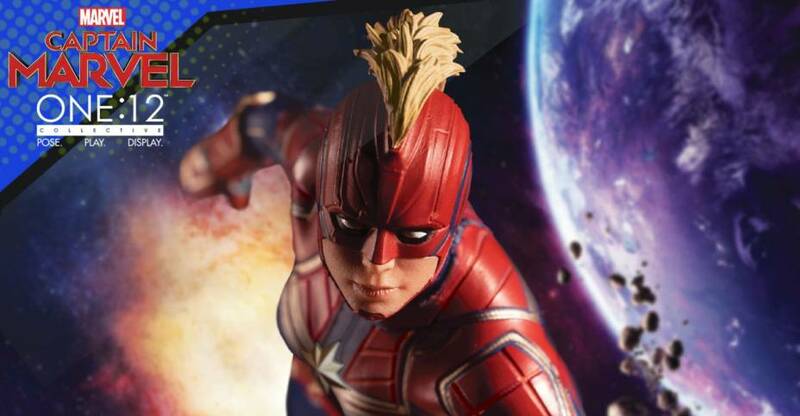 Captain Marvel includes three interchangeable heads, multiple interchangeable hands, Goose the Cat, a removable Bomber Jacket, and multiple energy effects pieces. A specialized figure stand is also included. The figure is priced at $8, with a release set for some time between November 2019 and January 2020. Pre-order at the link below. From the upcoming and highly-anticipated Marvel film, Captain Marvel joins the One:12 Collective. After an accident that caused her DNA to be fused with that of a Kree, Carol Danvers, better known as Captain Marvel, gained superhuman strength, energy projection, and flight. The story follows Captain Marvel as she becomes one of the universe’s most powerful heroes as Earth is caught in the middle of a galactic war between two alien races. Captain Marvel hits theaters on March 8th, 2019. You can watch the trailer here. Each One:12 Collective Captain Marvel figure is packaged in a collector friendly box, designed with collectors in mind. 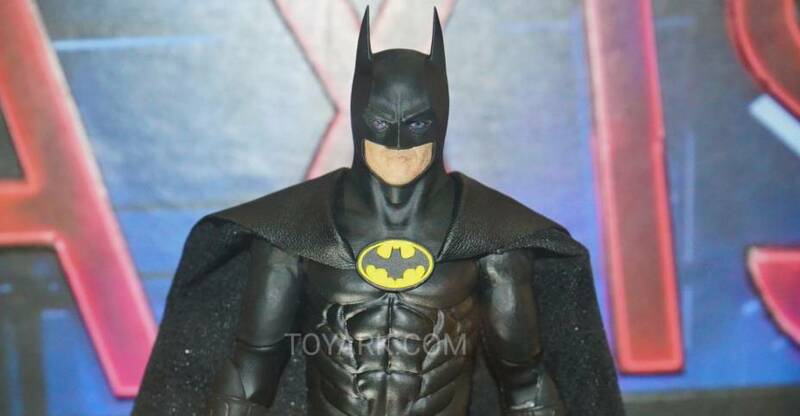 This past Saturday, Mezco Toyz held a kick-off event at the start of Toy Fair 2019, inviting media to their booth to show off all their new goods. After we did our coverage thing, Mezco graced us with a goodie bag that included not one but two Toy Fair 2019 exclusive figures. The One:12 Blade Toy Fair edition was the first (gallery coming soon), and second was the Agent Edition of their mascot Gomez. You probably recognize the profile of the head from their logo, and now he’s a full fledged One:12 action figure. The Agent Edition naming, along with instructions inside that references items not in this version implies he will be getting a mass release in different configuration later on. We’ve run him through a quick photo shoot on our first day back from Toy Fair, so read on to check it out! The Gomez – Agent Edition One:12 Collective Figure is now available to order directly from Mezco Toyz. The new figure is based on Mezco’s longtime Mascot! The figure is packed with interchangeable parts and accessories. they are also including a goodie bag with each purchase. It’s priced at $95. UPDATE 2 – Re-listed, in a slightly different form, later shipping time frame. 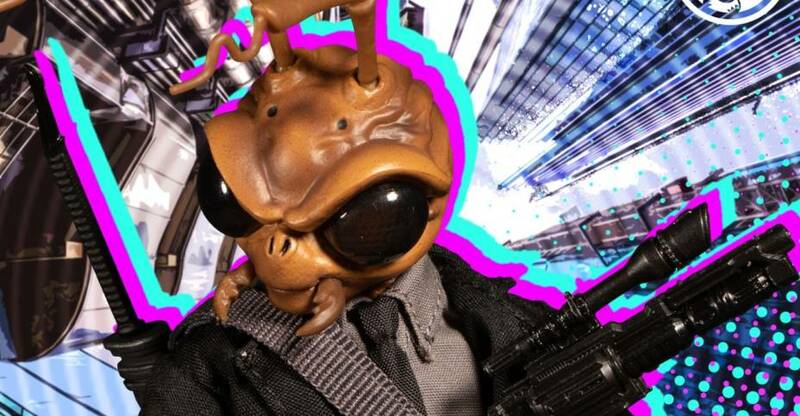 Prepared for any inter-dimensional mission, this insecta-sapien of mystery comes complete with an impressive arsenal consisting of a takedown “construct-rifle” that forms several weapons and conceals neatly in his boom box sidekick, Boom Boom. Also included are his trusty Cosmic Pea-Shooter, a small blaster pistol with a big kick, the Zip-Sword with sheath and adjustable cross-body strap, and two Doom Cocktail grenades. 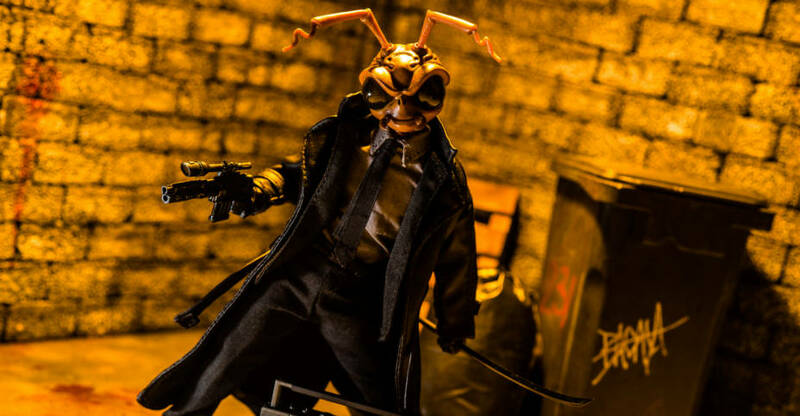 Dapper in his 2-piece suit, the Mezco Toyz mascot comes with a removable trench coat with an integrated posing wire in the belt. If that wasn’t enough, Gomez includes three interchangeable heads: his classic look, an updated modern look, a roach head, and a skull because skulls are always fun! Gomez, sole operating agent of The Void, receives instructions by a combined subliminal broadcast and interface with his boom box, Boom Boom. What adventures lie ahead – you decide. Each One:12 Collective Gomez – Agent Edition figure is packaged in a collector friendly box, designed with collectors in mind. Mezco has opened pre-orders for their new The Warriors One:12 Collective Box Set. 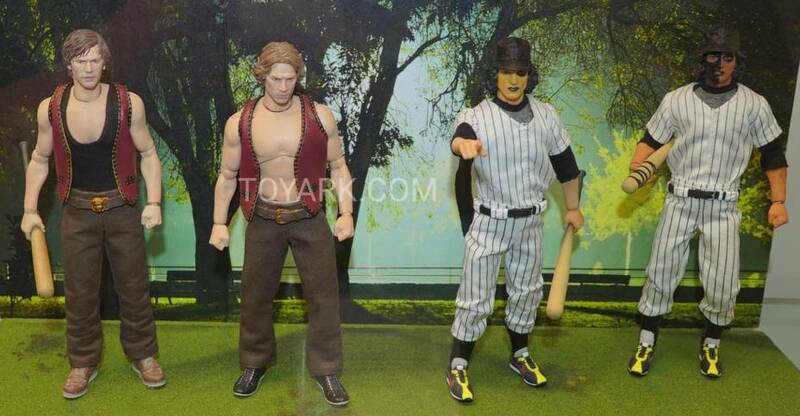 The set includes Swan and Ajax from The Warriors as well as two members of the Baseball Furies gang. The set will be priced at $275, with a release set between December 2019 and March 2020. Pre-order below, and see the photos after the jump. February 9, 2019 marks the 40th anniversary of the timeless cult hit, ‘The Warriors’. In honor of this occasion, The Warriors join the One:12 Collective with a four-figure deluxe box set and are packaged together in a special edition, collector-friendly metal tin – perfect for displaying alongside the gang! The One:12 Collective The Warriors Deluxe Box Set figure is packaged in a collector friendly metal tin, designed with collectors in mind. 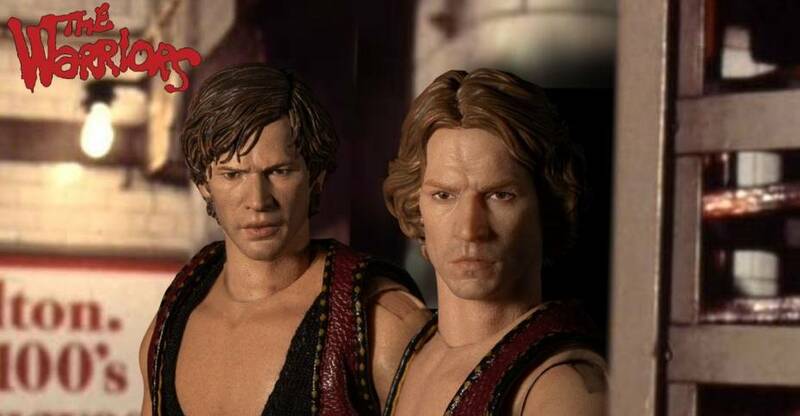 Mezco Toyz has announced that they will be opening up pre-orders for their The Warriors One:12 Collective Box Set very soon. They have posted the official product page, with just a few details. The set, which we’ve seen at both San Diego Comic-Con 2018 and New York Comic-Con 2018, will include four figures. For The Warriors, you get Swan and Ajax as well as two Baseball Furies. Pre-orders kick off on Saturday, February 9th at 1:00 PM EST. The set will be priced at $275, with a release set between December 2019 and March 2020. We will update with further details and photos as they become available.